Kentucky 4-H believes that all youth should have opportunities for positive youth development in our four guiding concepts: mastery, belonging, independence, and generosity. 4-H members work to master leadership and citizenship skills, this event inspires teens to continue their 4-H involvement through belonging to a group of like-minded peers and mentors. During this four-day conference, teens develop valuable life skills, leadership competencies and communication abilities. Delegates have an opportunity to practice independence while staying on the University of Kentucky campus living in dorms, visiting "The 90" and other academic and student life buildings that allow them to see how a real college student lives. Delegates are encouraged to explore their future education and degree plans by exploring all the University of Kentucky College of Agriculture, Food and Environment can offer. A service learning opportunity is provided for youth to practice generosity. Featured events include: Fashion Revue, the Culinary Challenge, State 4-H Officer elections, and selection of our future Teen Board members. Contact your 4-H agent for more information (Click Here for a list of County Extension Offices and Contact Information). 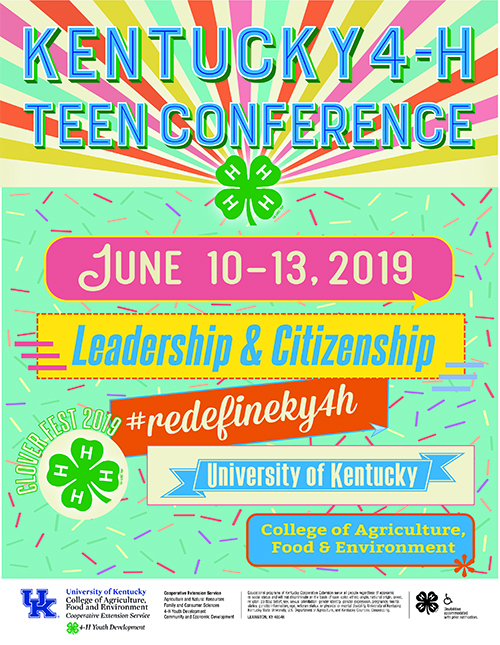 The objectives of Kentucky 4-H Teen Conference: develop leadership and teamwork skills, improve communication skills, foster civic engagement, expand knowledge and skills related to 4-H core content areas, gain club, county and state 4-H program skills, have fun, create a sense of belonging, expand social skills through networking, develop youth-adult partnerships, and become acquainted with the University of Kentucky to aid in college and career readiness of Kentucky 4-H’ers. Contact your county extension office for information regarding deadlines and fees (link).